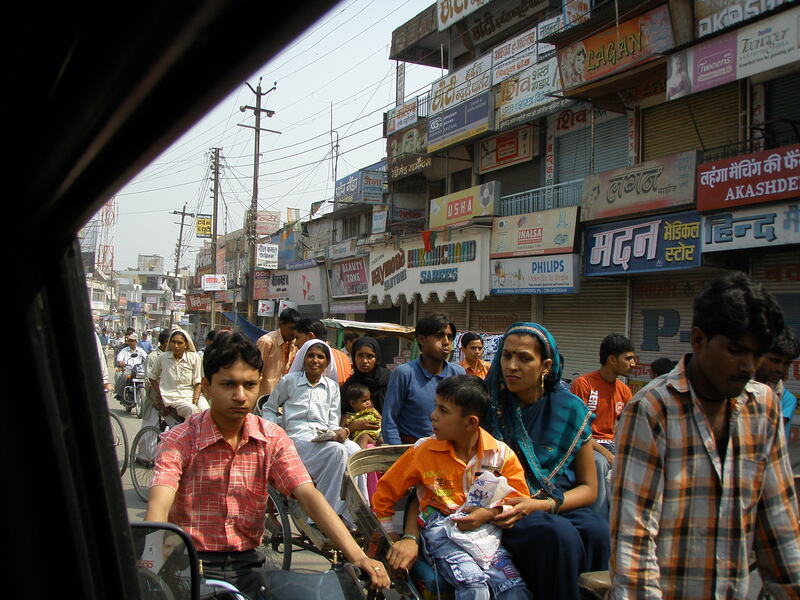 We entered a narrow lane crowded with shoppers, shopkeepers, motorcycles, rickshaws and animals. Throngs of people pushed their way past us, ogling us suspiciously, much like the dead fish lying in frozen ice in one of the shops, their eyes wide open staring at us. Above us there were twisted and tangled cables and wires, like spaghetti, hanging from buildings and poles. 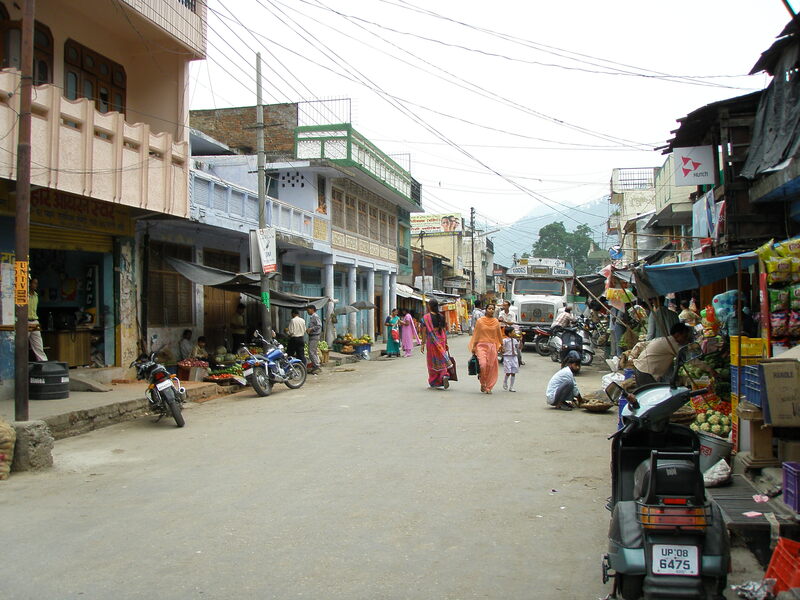 On each side were endless rows of shops with dirt floors and corrugated tin roofs held down with bricks or a log. My husband and I had decided to stray from our safe air-conditioned, carpeted hotel to visit Old Delhi. 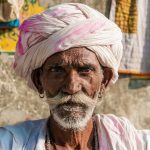 We wanted a taste of the authentic, the genuine, the original India, and we had been informed that this was the way to experience it. We were looking forward to seeing, sensing and feeling the pungent smells and fragrances, the brilliant colors, and the din of surging humanity we’d been told to expect. 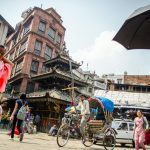 This densely populated market has been around for more than three centuries and was once a shopping destination for merchants from Turkey, China and even Holland. I had done my homework before coming. I knew that Dariba Kalanwas known for its pearl, gold and silver jewelry. That the cloth bazaar of Katra Neeloffered a wide range of fabrics like silks, satin, crepe, cotton and muslin. And I was especially looking forward to visiting Khari Baoli, which I was told was a must for spice-lovers. Our taxi had taken us to the entrance of the market and we had agreed to meet the driver back where he dropped us after exploring the market for two hours. In front of us, samosas were sizzling in hot oil over an open fire. I loved samosas. “Let’s try one,” I said, barely containing my excitement. The samosas had a delicate crispy and flaky outer layer and a rich filling of potatoes, peas and spices. We ate the samosas while standing a bit off to the side near a jumbled pile of embroidered bags stacked on the ground. I looked around me. On both sides of the alley lay a vast mix of shops. Tire outlets that also sold live chickens. Butchers. Food shops. Spice shops. Clothing. We turned into an even narrower lane, and were slammed with a stench that seemed to seep into our skin and embed itself into our cells. 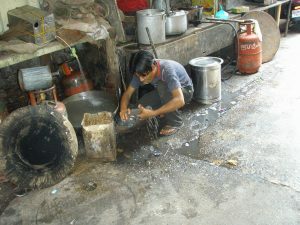 An open drain ran alongside the alleyway, taking with it rotten food, feces, plastic containers, and other unidentifiable stuff. A mangy black dog rummaged through the filthy trough. Ed began walking more quickly, his hand over his nose. “I don’t know how long I can take this,” he said. “We can turn back soon. Let’s just try this alley,” I said, turning into yet another dirty, congested, narrow lane. A cow ambled passed us. Numerous bicycle-pulled rickshaws,splashing foul sludge onto our legs, raced by. On our right, sitting on his legless trunk was a beggar, holding out a small tin cup. The throngs passing by didn’t even notice him. Now we both walked as quickly as we could, dodging rickshaws, carts, dogs, people. The alleyway ended and the crowds swept us into another one. And then another. My stomach pitched when I saw a man crouch by the side of the road, relieving himself in front of everyone. “We need to find our way back,” I said, trying to hide the panic I felt beginning to rise. “I have no idea where we are or how to get back,” my husband said, grabbing my hand. I have this condition. It’s called urgency incontinence or spastic bladder. What it really is, quite simply, is the urge to urinate even when the bladder isn’t full, and to suddenly pee at totally inappropriate times. My mother had it. Her mother before her had it. Research has indicated that one in three women have some form of incontinence. Menopause, old age and childbirth all contribute. Anyway, here I was, lost among this mass of people. Animals. Beggars. Filth. Crowds. Noise. Traffic. Stench. And I needed to pee. Bad. We were running now, ignoring the muck we splashed through. Suddenly, Ed looked up and grabbed my arm. “There’s the turret of the Red Fort. Now I know where we are,” he practically shouted, turning around and pulling me along behind him. I don’t do roller coasters. I can’t stand horror movies. And I had begun to pee in my pants. I ached to get back to my air-conditioned, quiet hotel room and take a long, hot, cleansing shower. 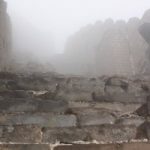 A small woman who looked dwarfed in a soiled salwar-kameez (Punjabi suit) several sizes too large for her thin body reached out her arm, stopping me. A tattered black scarf draped across the front of her body. “Where are you from, manji?” she asked me, her large dark eyes penetrating mine. “We’re from the United States,” I answered, attempting to push past her. Something about her mournful eyes was terribly unsettling. But also riveting. I stopped. This essay was previously published in GFT Press. Marlena Fiol, PhD, is a world-renowned author, scholar, speaker, and a spiritual seekerwhose writing explores the depths of who we are and what’s possible in our lives. Her most recent essays have appeared or are forthcoming in Under the Sun, The Summerset Review, Barely South Review and The Furious Gazelle,among others. A sampling of her publications on identity and learning are available at www.marlenafiol.com. 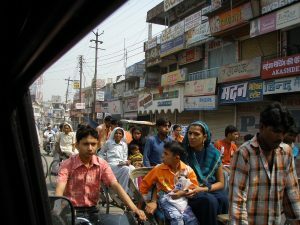 Monkey in Hotel Room, Varanasi, India Gridlock & Road Rage in the Desh Great Wall and Great Zoo India: Sixty million villages and still counting Conned By An Entire Community? What an experience! That would be unsettling for me too, and I’m Indian. Ha. Have you been to the markets in Old Delhi?